I’ve just returned from a week of glorious sunshine in Tenerife – a stunning place for the artist who likes dramatic rock scenery in all sorts of amazing colours. 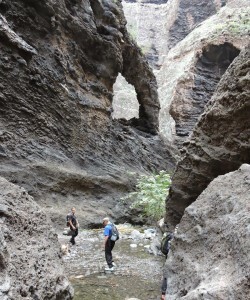 At one stage my feet seemed to be on fire from energetic hiking across sharp volcanic surfaces. Mostly I was alone, hiking and sketching in the mountains, but on one day I wanted to do some work in the amazing Masca Gorge. Unfortunately this would involve no less than 3 buses just to reach the top of the gorge, so to have any hope of actually doing it I needed to join a trekking company group trip. For the artist, however fast she or he works, sketching with a group is quite a challenge. 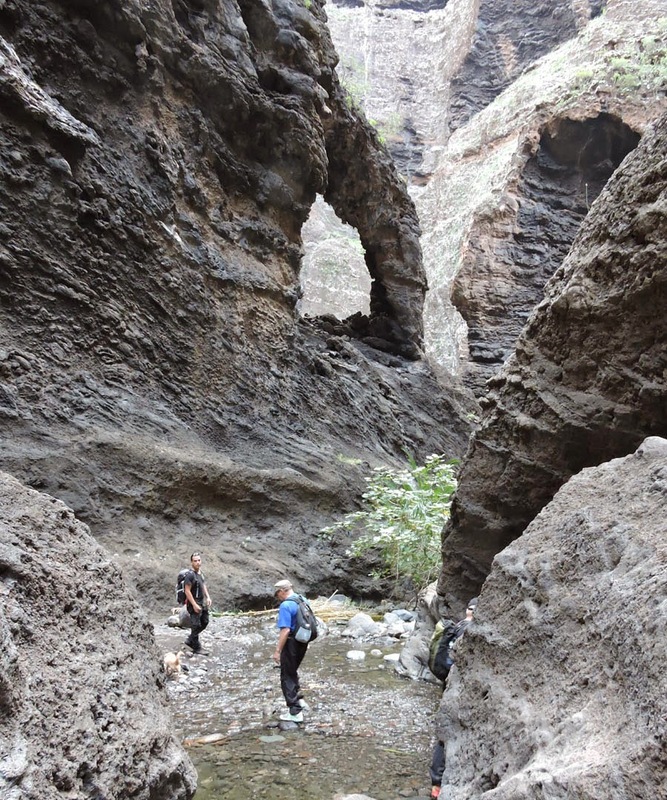 I chose the Scandinavian Canary Trek as they are a small company well tuned to the natural environment, and don’t take massive groups as some do. It was only when we were halfway to Masca that I mentioned to Victor, the Chilean guide, that I wished to do some sketching. Happily this did not phase him, and he only had three of us to look after. The other two were Finnish friends, Kaj and Krister and we moved quickly down the incredible gorge, seeming to cross the stream about 40 times. I mainly did pencil sketches, working in a linear manner when happily most of Victor’s stops to explain features coincided with a good sketching point. When this didn’t happen I simply filled in details and tones from memory. Over the years my visual memory has become well developed, though occasionally more than just a little imagination does tend to creep in! In the above photo of the Elephant Victor is on the left and Kaj crossing the stream. 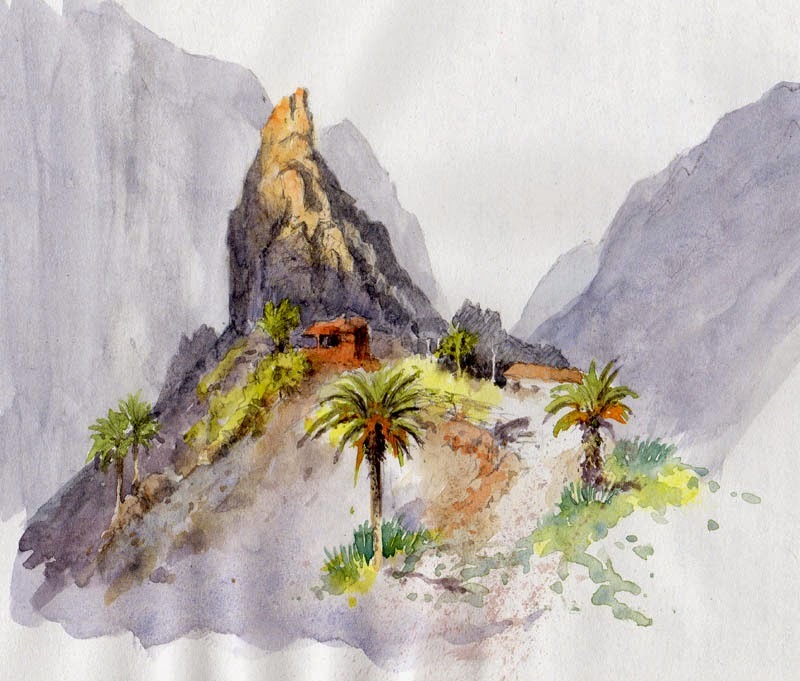 The one watercolour sketch of that day was finished later, and shows the sunlight striking the top of the massive crag at the end of the ridge on which part of Masca village is clustered. This is the start of the walk, and truly spectacular. For this I used a cartridge pad. In a painting I would move the central palm tree a little to the left, as it bothers me being so central. This is another reason why sketches are so important: they can highlight problems before you make them on the main painting. If you go out with non-artists and wish to do quick sketches then preparation is the key. Sharpen all your pencils beforehand, carry a small box of 5 or 6 colours of Inktense blocks or watercolour sticks, a sketchpad, water and 2 or 3 brushes. Watercolour pencils are also useful, but do keep your kit simple and easily and quickly accessible. Don’t forget a camera, of course. This entry was posted in aerial recession in landscape paintings, David Bellamy, sketching, Sketching Landscape Composition, sketching outdoors, Sketching travel by David Bellamy. Bookmark the permalink. Thank you for your guidances to paint plen air. They have been very useful and interesting. The sketch you have made is very expressive, I like it very much. Respectfully Mercedes.